An appealing landscape in pastel colors drenched in sparkling mist form the backdrop to a separately cut Tree of Life. 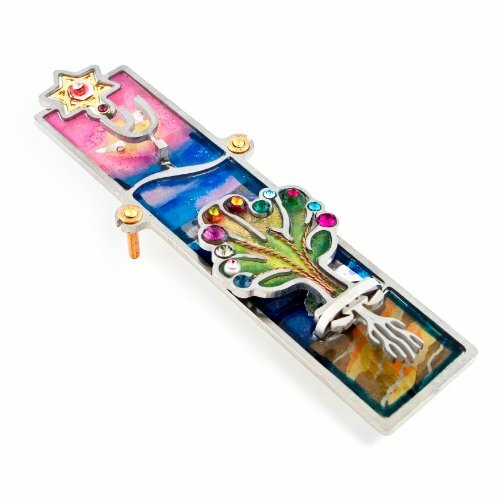 It is made by hand painting, followed by a variety of materials meticulously arranged inside the delicately cut stainless steel frame to form this beautifully finished Mezuzah case. The Mezuzah is a ceremonial object. The mitzvah or commandment of placing a Mezuzah is derived from Deuteronomy 6:4-9: "inscribe them on the doorposts of your house and on your gates". A Mezuzah is mounted on every doorway in a Jewish home. Included are mounting screws or nails, a photocopy and a translation of the Mezuzah scroll or the Shema prayer, and placement instructions. Our Mezuzah cases can also be mounted outdoors, preferably under an overhang. A Kosher Mezuzah Scroll, handwritten by a scribe in Israel is available separately from The Artazia Collection. Each Mezuzah Case is truly like a miniature artwork. Measures 4 3/4" High by 1 1/4" wide"
Manufacturer: The Handmade Group Inc. Publisher: The Handmade Group Inc. Studio: The Handmade Group Inc. If you have any questions about this product by The Artazia Collection, contact us by completing and submitting the form below. If you are looking for a specif part number, please include it with your message.